"The dress I was wearing, although adjusted to fit my somewhat larger and taller frame, was the same dress that my grandmother (1948) and mother (1976) both wore. It was bought off the rack by my namesake, my great-grandmother, for my grandmother's wedding and is champagne satin. An amazing Saville Row tailor, Carol Alayne, altered it by adding a new bodice (the beading was added by my grandmother after her wedding to make the dress a cocktail gown) and floaty sleeves. I felt like a princess wearing the most beautiful hairpieces, jewellery inherited from my mother and grandmother (all pearls to match your pins!) and custom made shoes by an amazing company called Shoes of Prey." 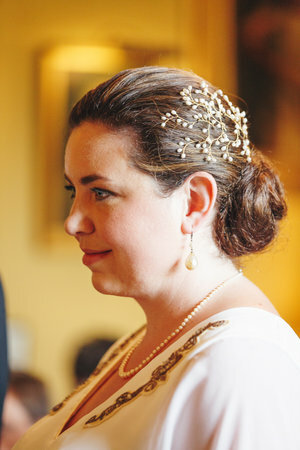 We are delighted to have been a part Eva's wedding look. Such an honour to match a dress like hers with our favourite Lily Hairpins. Thank you Eva for sharing your beautiful story and wedding photographs with us. Amazing wedding photography by Crescent Photography​.